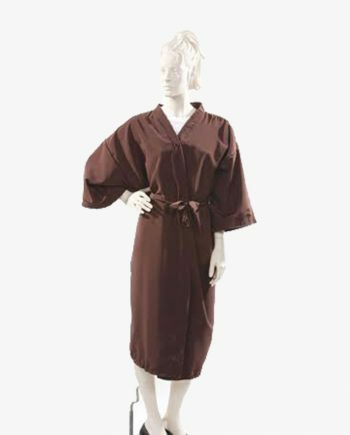 Anyone from the salon industry will state that gowns are one of the most indispensable apparels in the salon and beauty industry. Salonwear designer salon gowns are silky soft and bestow splendid comfort to customers who adorn them. Our designer gowns are sophistically designed and give your business a posh and professional ambiance at a very reasonable price. The innovative designer gown is crafted to meet the needs and problems of today’s salon artists. Quality and comfort are two main features of this product, and we can proudly say that Salonwear designer gowns are one of the best designer gowns in the market. Our designer smocks look very stylish, without compromising on functionality and comfort. Salonwear’s designer gown is a top of the line salon product that is made from an exclusive fabric that provides incomparable protection and ease of movement. The fabric used to construct this designer gown is such that it allows the stylists to freely go about their daily salon routines without any hindrance. 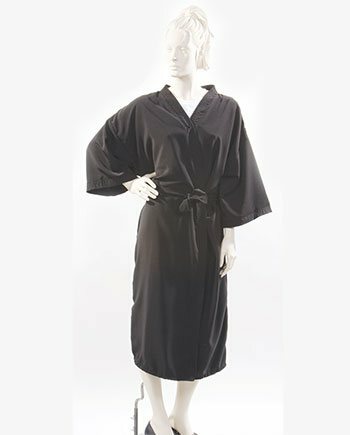 We also offer other salon robes for our customers such as client gowns, euro wraps, short sleeved client gowns, cape/drape, big shirts, and sleeved cape and gown. Due to the high durability of Salonwear’s product, the clients do not have to worry about purchasing a salon gown repeatedly, and can thus save money. The designer gown is a mid-length salon gown, with a front fastening design, attached belt and flowy full-length sleeves with decorative stitching to give the clients an extra dose of style. The stylists and the customers will experience nothing but pleasure wearing these designer gowns. The Salonwear designer gowns are crafted from the rich and lustrous peachskin fabric. The texture of this fabric gives it exactly the feel of a soft peach fruit. The designer gown made from peachskin fabric has a soft feel to it and is the coziest gown to wear. This medium weight fabric allows the gown to flow freely with your movement and drapes admirably. The gown’s extra-large design ensures that it fits all clients. Our designer gowns on sale are available in two beautiful colors of black and brown. Black and brown are timeless colors and ensure that these gowns look elegant and professional. Why choose Salonwear’s designer smocks? For the last 31 years, Salonwear has been a prime leader in the salon accessories and apparels market. We have been delivering swift and persistent advancements in our products by continuously innovating and incorporating customer feedback in our new product lines and designs. Salonwear is a family owned business, spread across US. We prioritize bringing in new designs and innovations in our products range by studying and analyzing upcoming trends in the industry. We take it as a challenge to provide our clients with innovative products so that it helps them in their business. This is one of the reasons why our pool of satisfied and loyal repeat customers is always expanding.